If you allow your papers to take over, chances are your productivity and mental clarity are going to suffer. 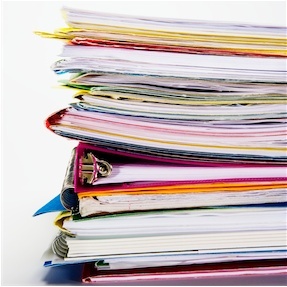 Below are some tips for combating information overload and managing all the bits of paper that enter your life. If you don’t review what’s in your files, you forget. It’s as simple as that. You need to be disciplined to set aside time every few months to review your papers. “A real review process will lead to enhanced and proactive new thinking in key areas of your life and work”. Doing a review is a great opportunity to toss out any papers that you no longer need. Challenge yourself. Set a timer for 8 minutes and see how much you can fill it with in that period of time. Be strong and work fast. And just remember, you probably won’t miss the document or even remember that you had it in the first place. Don’t allow mountains of papers to form in your room or office. If you can file a document away in under 2 minutes, do it. Is it general reference material that needs to be filed away? Do I need to take some form of action in relation to the item? If so, what’s the next small step I need to take? If it will bring very little benefit and the document doesn’t serve a need or purpose, be strong and don’t let the document enter your space. If you feel mentally overwhelmed by your papers, just say to yourself that all you need to do is a 10 minute purge. That’s all. Every day for a week. That’s at least 50 minutes of paper purging. And a whole lot of mental relief. You see, when you get rid of useless papers and review your files regularly, you feel lighter and more in control of your life. You can also make better decisions and work more efficiently because you know where things are. I challenge you to start the paper purge today. Set up a recycling bin, grab a timer and go for it! See what kind of difference it makes to your thinking and productivity. I have to say, life is better without my criminal law notes from first year university.